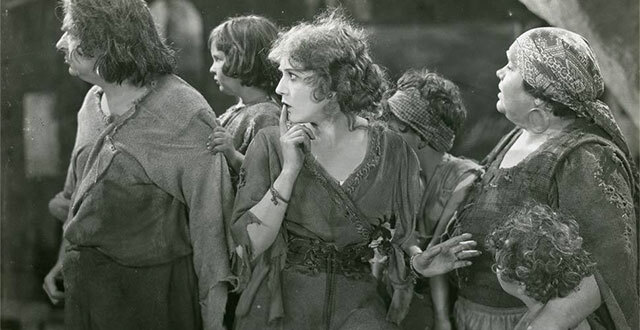 Rosita, famed as the single collaboration between two of the giants of the silent screen, the director Ernst Lubitsch and the star Mary Pickford, is the film that has been chosen for the Pre-inaugural evening of the 74th Venice International Film Festival. Rosita, will be screened in a new 4K digital restoration effected by the Museum of Modern Art (MoMA) in New York, with the support of The Film Foundation; this will be the restored version’s world premiere. The screening of Rosita will feature live music played by the Mitteleuropa Orchestra of Friuli – Venezia Giulia, directed by the musicologist Gillian Anderson, who has reconstructed the film’s original score by working on scores recovered at the Congressional Library in Washington, D.C.
Rosita is set in a mythical Spain where an engagingly lecherous King (Holbrook Blinn) has cast his eye on a popular but provocative street singer (Mary Pickford). She, in turn, yearns for the handsome young nobleman (George Walsh, brother of the celebrated director Raoul Walsh), who has rescued her from the angry king’s guards and has been condemned to a dungeon for his troubles. Following the American success of his German historical epics (Madame DuBarry, Anna Boleyn), Ernst Lubitsch was invited to Hollywood by Mary Pickford to direct her in what would become her first adult role, as a street singer of Seville who attracts the flattering but inconvenient interest of the King of Spain (Holbrook Blinn). The film was, by all accounts, a major critical and commercial success on its first release, but in later years Pickford turned against it, for reasons that still remain mysterious, and decides to allow the film to decay (she did, however, preserve reel four, for reasons no less mysterious). Rosita vanished from circulation until a nitrate print was discovered in the Russian archives and repatriated by the Museum of Modern Art in the 1960s. A safety preservation negative was made from the nitrate print, but no further work was done on the film because of the expense and difficulty of recreating the English intertitles. Happily, a copy of a complete continuity script, which includes all of the intertitles, surfaced in the collection of the Academy of Motion Picture Arts and Sciences. Using the titles in Pickford’s preserved fourth reel as a template, new intertitles have been created to match the original. Working with this new material, MoMA has recreated this celebrated but severely damaged film in a form as close as possible to its original release. Musicologist Gillian Anderson has recreated the original theatrical score, working from the music cue sheets surviving at the Library of Congress. The Mitteleuropa Orchestra belongs to a long musical tradition focusing on central and southern Europe. In the early 2000s, it was institutionalized by the Friuli Venezia Giulia Region and supported by several municipalities and provinces in the region. It currently counts 47 stable orchestra professors and a solid independent management. Its headquarter is in the Loggia della Gran Guardia in Palamanova, a historical building dating back to the XVI century, facing the marvellous square of the famous star-shaped city. Since January 2017, the Orchestra Music Director is Master Marco Guidarini. His versatile repertoire goes from baroque to contemporary, from classical to cross-over music. The Mitteleuropa Orchestra played successfully both in Italy and abroad – France, Tunisia, Egypt, Morocco, Turkey, Slovenia, Croatia, Serbia, Bosnia, Montenegro, Albania. It participated in many international events, from Venice Music Biennale to Mittelfest, from the Pordenone Silent Film Festival to the concert for the beatification of John Paul II.